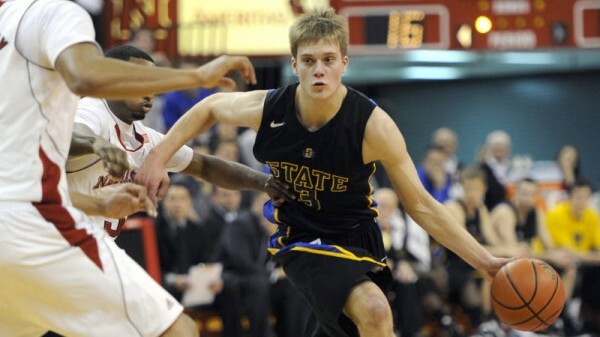 G: Nate Wolters, South Dakota State (21.2 PPG, 5.1 RPG, 5.9 APG) – Nate Wolters got a lot of hype from the media after his season in 2011, but it wasn’t unwarranted. Wolters led the Jackrabbits team in points, rebounds, assists and steals on their way to the NCAA Tournament last year. He is hands down the favorite for Player of the Year, and no one else is even close. G: Taylor Braun, North Dakota State (15.4 PPG, 45% 3FG) – Braun led one of the top scoring teams in the nation last year with his ridiculous 45-percent shooting from beyond the arc. He will have to be just as good in he wants to lead North Dakota State past their rivals in the South. F: Ceola Clark III, Western Illinois (13.3 PPG, Two-time defending Summit League Defensive POY) — Clark made history by becoming the first Summit League player to win Defensive Player of the Year twice. Could he set the precedent and make it three in a row? G: Frank Gaines, IPFW (21.2 PPG) — Gaines became the first player in IPFW history to make the All-League first team list at the end of last season, and he led the NCAA in scoring for a good portion of the season before finishing ninth. F: Jordan Dykstra, South Dakota State (11.3 PPG, 4.9 RPG)— The big man was part of South Dakota States highly touted recruiting class a few years ago, and he is finally starting to assert himself as the best forward in the conference. 6th Man: Travis Bader, Oakland (15.9 PPG, 124 3FG) — Even though Bader rarely started the game on the bench for Oakland last season, I couldn’t leave him off my preseason all-conference team. Recognized by Jay Bilas as one of the country’s best three-point shooters, Bader will be key for taking Oakland back to the dance. Impact Newcomer – Lloyd Neely, Oakland: Neely was a finalist for Mr. Basketball in Michigan and will have a great chance to develop into star under Greg Kampe. South Dakota State (NCAA Seed: #14): South Dakota State is the unanimous preseason pick, as they should be. A 92-73 victory over Washington last season and a good showing in the NCAA tournament against Baylor showed everyone that they can compete with the talent they have. The loss of Griffan Callahan will make a big impact on this team because he was a leader and he took the pressure off Wolters from having to carry the entire load. Can they handle the pressure of being the favorite and get the job done? With only a couple teams talented enough to pose a real threat, it’s a safe bet to roll with the Jacks. North Dakota State—With the Summit League Tournament now in South Dakota, the Bison have the best chance of offsetting the home court advantage of the Jacks and pulling off an upset, not to mention the fact that they can score a bunch of points with a number of three-point specialists. They also have the most talent and experience out of all the other contenders. The regular season match-ups between these two teams will be something to keep an eye on. Oakland—The Golden Grizzlies stacked their roster in the offseason with the best recruiting class in the conference, but will it pay immediate dividends? The future of the program under Greg Kampe looks secure, but they will have to rise to the experience and talent of the Dakotas in order to challenge for a conference title. Western Illinois—Preseason First Team selections Ceola Clark and Terell Parks will have to combine for a huge effort in order to make another run to the conference final. They got there by playing defense, and that will have to be the case again this season. The Leathernecks will no doubt miss Obi Emegano (transferred), the Newcomer of the Year last season who played a big role in taking them within a game of the Big Dance. Omaha: the University of Omaha is the most notable newcomer to the Summit League, to say the least. Joining the Division I ranks will be a difficult transition at first (see South Dakota last season), but the Mavs have a good center in John Karhoff, which can keep you in a lot of games in this league where quality big men are hard to come by. Oakland Transfers Tommie McCune (West Virginia), Duke Mondy (Providence) and Ralph Hill (Dayton): If The Golden Grizzlies are going to have a smooth transition past the Hamilton-era (another great transfer for Greg Kampe), then they will need to get instant production from Mondy, Hill, and McCune, who are the highest profile transfers into the Summit League this season. South Dakota State is clearly the best team in this conference. With the departure of Oral Roberts, there won’t be another team that can challenge them in the regular season. There is always room for upsets in college basketball, and it could be that North Dakota State or Oakland has enough firepower to upset the Jacks in the Summite League Tournament, but this is one of those seasons where you sit back and see how far a team like SDSU can go. The conference is in a big transition, and it may even take a hit in its RPI as a result. But fans of the Dakotas will be thrilled with the changes, as they are about to take control of power in the conference. This entry was posted on Thursday, October 25th, 2012 at 10:29 am by Brian Goodman	and is filed under 2012-13 Season Preview, conference primers. Tagged: ceola clark iii, duke mondy, frank gaines, ipfw, iupui, jordan dykstra, lloyd neely, Nate Wolters, north dakota state, oakland, omaha, ralph hill, South Dakota, south dakota state, taylor braun, tommie mccune, travis bader, umkc, western illinois. You can follow any responses to this entry through the RSS 2.0 feed. You can leave a response, or trackback from your own site.